I work with analogue cameras and shoot black and white film. My attention has turned towards photographing abstract still lifes, or rather, I find myself taking pictures of light itself, using objects to capture the play of light and shadow and the visual rhythm between these two siblings, the sometimes faded border between them, their reflections, opacities. Play is essential to my practice. I am continually falling in love with shapes, forms, beautifully broken things. I approach my subjects with an analytic attitude, later creating larger-than-life-sized images of tiny wonders in the darkroom. In this way I am able to showcase the minute details invisible to the naked eye, revealing a hidden world that speaks in the intuitive language of emotion, unlike its hardened opponent, the intellect. My intention is to slow down the viewer, to get them lost in the details, by following patterns and forms that the mysterious phenomenon of light inevitably draws. After studying photography in Budapest, she moved to Berlin where she became the apprentice of fine-arts photographer Jeff Cowen, a position she held for many years. While there, she was trained in the art of traditional silver black-and-white printing of large-format photographs on a masterful level, including numerous alternative processes. 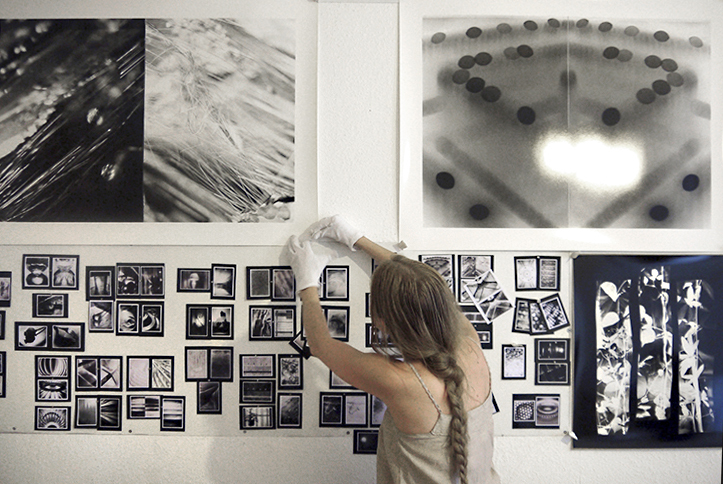 She then became a professional printer; over the past few years she has printed exhibitions for international artists such as Antanas Sutkus and Arja Hyytiainen. She also conducts printing and portfolio workshops in her darkroom in Berlin, and is for hire to do commissioned portraiture. Parallel to her commissioned printing work, she’s been diligently creating her own photographic works of art. Recently, she has participated in several exhibitions, and her works can be found in different art collections, such as that of the Ritz Carlton Hotel Budapest and private collections in New York, Paris, Hong-Kong, Berlin, and Budapest.